I know I’ve said this before, but a whole lot of organic chemistry can be boiled down to “nucleophile attacks electrophile“. 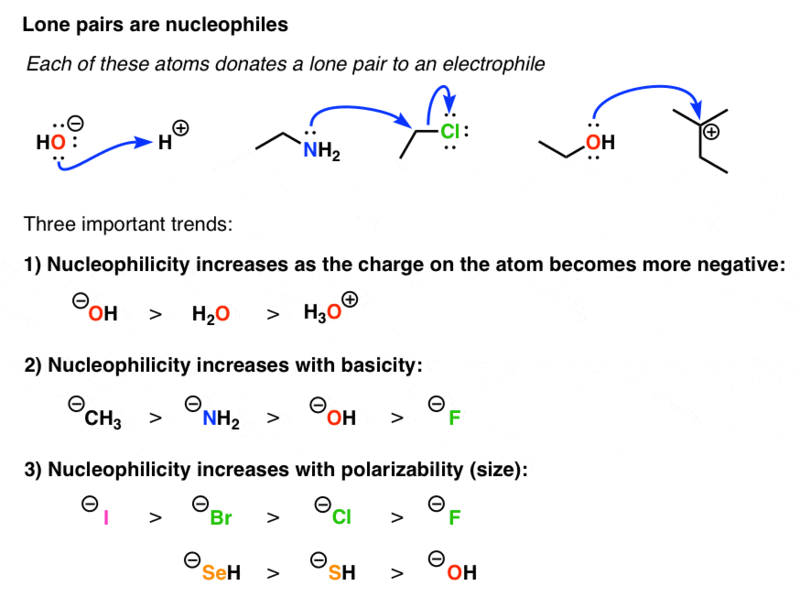 A nucleophile is a compound that can donate a pair of electrons to (you guessed it) an electrophile, which results in the formation of a chemical bond. If you look closely at nucleophiles, you’ll see that they fall into three broad categories. That’s what today’s post is about: seeing these patterns. This is probably the easiest class of nucleophiles to understand, because of the parallels to basicity. After all, what is an acid-base reaction but the combination of a lone pair on an atom with a proton? There are several key trends to keep track of when assessing the strength of lone pairs as nucleophiles. The nucleophilicity increases as the charge of the atom it is attached to decreases. A simpler way to put this is, “the conjugate base is always a stronger nucleophile”. The nucleophilicity increases as you increase the basicity. So as you go across the periodic table from right to left, nucleophilicity also increases. [H3C(-) > H2N(-) > HO(-) > F(-) ). Of course you might be able to spot a contradiction here: iodine is more polarizable than fluorine, but it is also less basic. So when these two trends collide, what wins? The wishy washy answer is that “it depends”. Solvent is a key variable here. In polar protic solvents, nucleophilicity increases with polarizability, because hydrogen bonds form a shell around the less polarizable atoms and decrease their nucleophilicity. In polar aprotic solvents, this is not an issue, so basicity is the most important variable. [Ultimately, when trends collide, however, the final arbiter is experiment]. 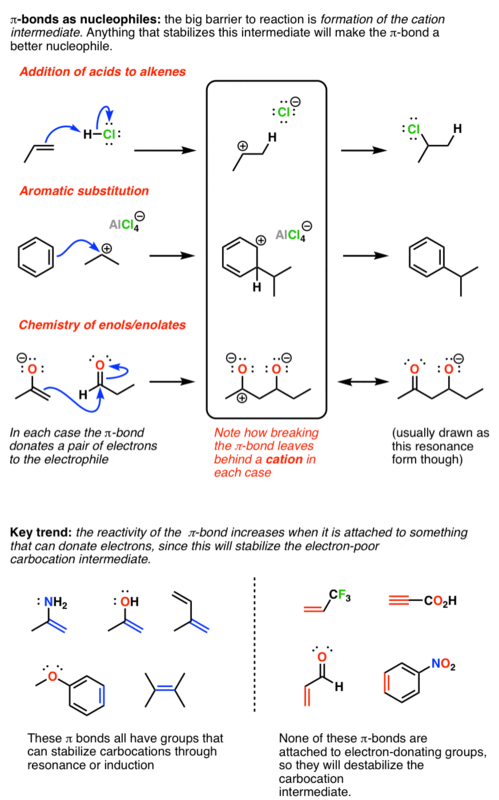 EDIT: Alert reader Prasanna reminds me that these trends hold for SN2 reactions, but trend #3 is less important for reactions where the nucleophile is adding to unsaturated carbon (carbonyls and aromatics). One of the challenges of understanding nucleophilicity is that it is highly dependent on the electrophile. π bonds can also be thought of as nucleophiles: they donate a pair of electrons as well, but in this case the pair is shared between two atoms. This not only covers double bonds, but also triple bonds (alkynes) as well as aromatics and even enols and enolates (in Org 2). The key trend that determines nucleophilicity of π bonds is the presence of donor groups. By donor groups I mean an atom that can share electrons with the double bond to help stabilize it after it has donated its pair of electrons to the electrophile. This should hopefully make sense: after all, when a double bond reacts with an electrophile, the result is a carbocation (a high-energy species). Electron-donor groups help to stabilize the carbocation through donation of electrons. Anything which makes the carbocation more stable is going to lower the activation energy for the reaction and make it faster. 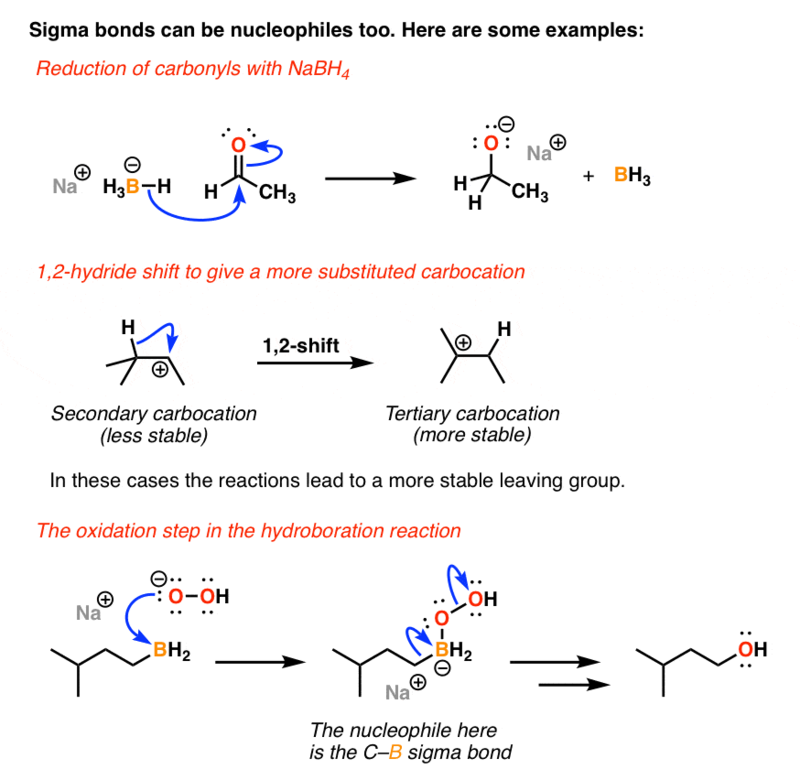 Note that in order for a sigma bond to act as a nucleophile, we have to break that sigma bond. Therefore, the #1 most important factor governing the nucleophilicity of sigma bonds is the leaving group. In two of those cases, the sigma bond is attached to a negatively charged atom that will become neutral once the bond is broken. In the third case (the hydride shift) we’re changing from a very unstable secondary carbocation to a more stable tertiary carbocation. Did this post miss anything? Anything I should have covered? Leave a comment! It is really difficult to think pi bond or Sigma bond as nucleophiles. Can’t i consider Cl(-ve) or Br(-ve) as nucleophiles when reacting with double bond or triple bond, i mean wherever u are considering pi bond as nucleophile i am considering the negative ion” as nucleophile and it becomes really easy yet I have faced no objection in explaining the reaction. My question is would I be hampered in future if I continue to do this?? Your explanation really helped make sense of things, thanks so much for posting! Great site. What would be the order of increasing nucleophilicity between these 3 factors? Is it lone pairs > pi bond > sigma bond, which produce greater nucleophile strength, or what other factors would it depend upon? Hi, I’m having trouble understanding why CH3 is more basic than OH. Isn’t OH considered to be a very strong base, or am I getting mixed up here? Anyways, thank you for your helpful website! (-)OH is a very strong base. However as we go to the left of O on the periodic table, electronegativity goes down, which means the electrons are held less tightly. So a negative charge on nitrogen such as in (-)NH2 will be considerably more unstable , which translates as “more basic”. A full negative charge on carbon, which is even less electronegative than nitrogen, will be even less tightly held (and more unstable). (-)CH3 is thus even more basic than (-)NH2 which in turn is more basic than (-)OH. Why is Iodine less basic than Fluorine? Iodine outer electrons would be held less tightly than Fluorine as it is a much larger atom and its inner electron shells would shield the valence electrons from the nuclear pull where the protons lie. Iodine is less basic in reactions than fluorine is because it is less electronegative. Fluorine has the highest electronegativity of any chemical element.